From the foreword by Hamish MacInnes: "If you have an ambition to do all the climbs in these two Scottish Rock guides I think you'd better schedule time off in your next life. This labour of Gary's has been of gargantuan proportions. Those of you who use the guides will benefit by his dedication and the sheer choice offered; if you divide the retail price of these by the number of good routes you'll realise what a bargain this is." 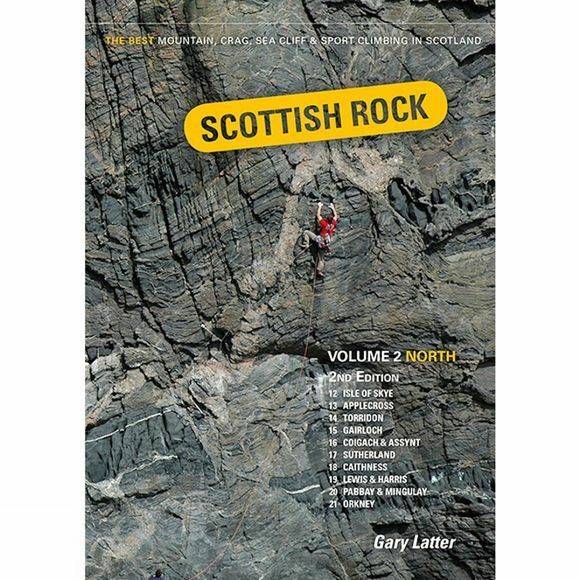 This second volume of Scottish Rock is a selective rock climbing guide to over 2,400 routes in the North-West, the Far North, the Hebrides and Orkney. Volume one extends this area south of the great Glen. these guides will take you to some extraordinary places to experience some of the best rock climbing and scrambling around. Explore the renowned rough Cuillin gabbro on Skye, sample the delights of sea cliff climbing on the islands of Lewis, Pabbay, Mingulay and Orkney. From convenient roadside crags to remote mountain routes and Hebridean sea cliffs, they're all here. In this new edition the remote nature of the area means that many of the routes are relatively new, the situation is very fluid, and consensus on grades is just emerging. there have been numerous grade adjustments, improvements in descriptions, some topo corrections, and some new routes. Featuring over 2,400 of the region's best routes from Moderate difficulty to top-end Extremes; accessible multi-pitch mountain routes and scrambles; sport climbs from F5 to F8b+; 250 full colour photo topos; scale area maps highlighting the approaches; inspirational photographs, including many first ascents. Selected climbs in Isle of Skye, Applecross, Torridon, Gairloch, Goigach and Assynt, Sutherland, Caithness, Outer Hebrides – Lewis and Harris, Barra Isles – Pabbay and Mingulay, Northern Isles – Orkney.